The Board of Directors of the Foundation of Collier County Medical Society (CCMS) is pleased to announce the appointment of Dr. Rebekah Bernard as a new Board Member. Dr. Bernard will work with the Board to raise and manage funds for healthcare scholarships and programs that address access to healthcare, as well as help plan the Foundation’s “Docs & Duffers” fall 2018 charity golf tournament. Dr. Bernard is a Family Physician in a private Direct Primary Care practice in Estero. 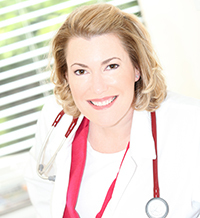 A Florida native, Dr. Bernard grew up in Clewiston, attended the University of Florida graduating with a degree in Sociology, and received her medical degree from the University of Miami. She completed her residency at Florida Hospital in Orlando, and served for 6 years in Immokalee as a National Health Service Corps Scholar. Dr. Bernard also serves as secretary on the CCMS Board of Directors and is the author of How to Be A Rock Star Doctor. The Foundation of CCMS is a 501(c)3 charitable organization launched by the Medical Society in 2012, with the mission to provide support and leadership to programs that address access to healthcare and promote health education. For more information visit ccmsfoundation.org or call 239.435.7727.